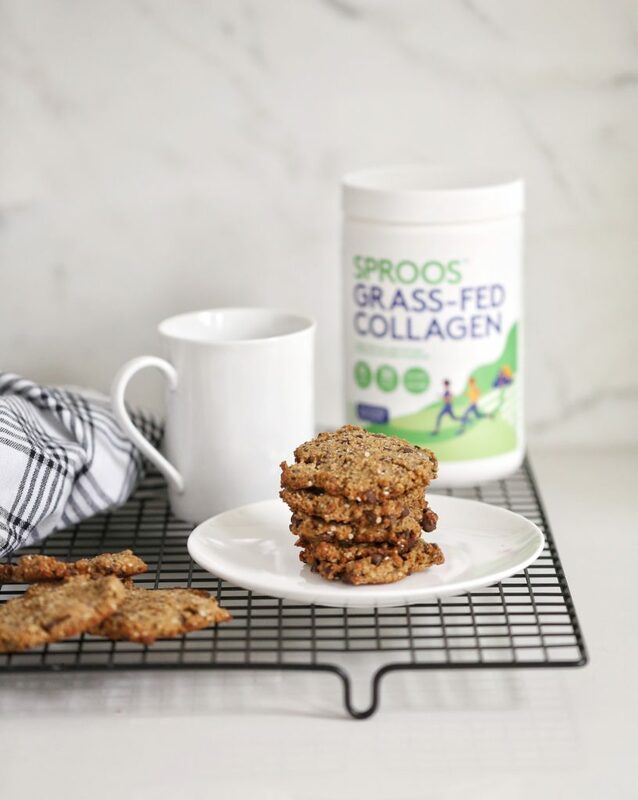 These cookies are grain, dairy and egg free, and, might just be the best cookies you ever make! Full of protein, fibre and of course, the added benefits of collagen! You can keep the cookies in a sealed container at room temperature for at least a week or in the freezer for a few months. Preheat the oven to 350°F and line a baking sheet with parchment paper. In a large bowl, combine the flax meal with 6 tablespoons water and let sit for 5 minutes. In a separate bowl, combine the almond flour, hemp hearts, chia, and sea salt. Add the collagen to the flax mixture and whisk well until mostly dissolved. Add the melted coconut oil, coconut sugar and vanilla and whisk well again. Pour the dry ingredients into the wet ingredients and combine. Spoon teaspoonfuls of batter onto the prepared baking tray about 3 inches apart. Use the back of a damp teaspoon to flatten the cookies into ¼ thick rounds. Sprinkle each cookie with sea salt. Bake for 13-15 minutes until dark golden around the edges but still slightly soft in the middle. Cool on a wire rack, serve room temperature warm, and enjoy!